If we are hired to film matches on a regular basis for a particular Non-League club during the course of a season, a signed agreement will be drawn up consisting of various terms and conditions. Normally, the deal is for us to film for a minimum of £120.00 per match (including travel expenses to and from the ground), with unedited footage of the game being uploaded to an online platform of the club’s choice for the Manager, the coaching staff and the Referee’s Assessor to view and edit themselves within 24 hours of the match finishing. The £120.00 also includes editing and uploading highlights if necessary, normally within 48 hours of the game finishing. Payment is made either in cash on the day of the match or by bank transfer before the next match is filmed. Normally the agreement is to film Home matches only, as most clubs at the top level of Non-League football have their own Club Cameraman. An Away match will only be filmed if permission has been gained from the Home Club Secretary and/or Home Club Cameraman. If the deal with the Non-League club we film for is that we retain the copyright (as opposed to giving them the SD card straight from the camera on the final whistle for them to process the footage th emselves), we then save the footage of each match on an external hard drive for future use if necessary. 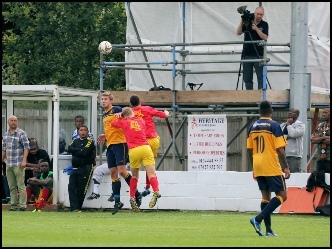 Most Non-League matches are generally filmed in stadiums or 'fenced-in' grounds at which there is normally a reasonable vantage point on or near the half-way line for us to use just the one camera set up on a tripod. Of course some Non-League grounds are not ideal for filming a game of football and some of our recordings are spoilt slightly by pillars obscuring parts of the pitch or by having to film matches at touchline level for various reasons. However, we always ensure that we have a clear view of both goalmouths whenever we are filming, so goals are never missed because of a pillar, a linesman or a spectator's head getting in the way ! If your club intend having every Home match filmed properly and there is no suitable vantage point, then ideally a properly-constructed gantry needs to be built similar to the one in the picture left. All matches covered since January 2014 have been recorded using a Canon XA20 and its now-upgraded model, the Canon XA11. This camera is perfect for the one-camera filming of football matches as it has a 20x optical zoom and records in AVCHD 1080p high definition with a 50 frames per second frame rate and a 28Mbps bit-rate, which is ideal for online viewing on You Tube, Vimeo and other media. If we are hired by clubs or TV companies for TV broadcasting in the 1080i/50i format though, the Canon XA11 is not really suitable and we would need to use equipment supplied by that particular TV company instead, as is the case at Ebbsfleet United who we currently film for in the National League using BT Sport’s Sony HXR-NX3 camera provided. When uploading whole match footage for Management/Coaching Staff/Referee Assessor downloading, we convert the original camera footage down to an MP4 720p 5-7Mbps bit-rate file so that the download can be completed in less than an hour (dependent on the broadband connection available). All Non-League matches are filmed by starting the recording from the players entering the pitch for the pre-match respect handshakes, then the Captains shaking hands with the Referee. We may film the odd cutaway shot of the crowd and other things happening in the stadium just before or after the teams enter the pitch, but in general we just film the whole match and nothing else (apart from post-match trophy presentations if it is a Cup Final). If the filming of post-match interviews are required, the club who have booked us to film the match MUST provide the interviewer. We do not film pre-match coach journeys, warm-ups, team-talks or Half-Time entertainment, mainly because we need a rest and they are things that can be filmed easily by anybody. Our expertise is in filming the fast-moving action of a match, which is something that volunteers often find difficult. However, we do have professional commentary as an option on our Price List should teams wish to pay for it. (This is subject to availability, as our regular freelance commentator is much-in-demand). We film all matches in the same way as regards ensuring that the camerawork caters both for match highlights for the supporters and also tactical/performance analysis for the players & coaching staff. The camerawork will ensure that players will be in shot for set-pieces as much as possible (for the coaching staff to analyse), but it will also have close-ups of players when the ball goes dead. General play will be filmed as a ‘Camera One’ would film from a TV gantry for a live televised match. (I.e. Not too distant, but not close-up either). If we are editing & producing match highlights ourselves (for uploading to our own You Tube channel), we only use budget-range Corel Video Studio software as we are no experts at producing fancy graphics and state-of-the-art titling...unlike some of our competitors who specialise in thatsort of production, sometimes at the expense of the actual match content. We prefer to ensure that the footage is edited properly and that slow-motion replays are inserted at the right times, whilst keeping the special effects (and music) to a minimum. Most Non-League clubs nowadays prefer to hire us for our expertise in actually filming the match whilst doing their own highlights editing & production though, and that is certainly more preferable for us. WHERE CAN WE PARK AT THE GROUND ? WHICH ENTRANCE DO WE GO IN ? WILL THERE BE A 'PRESS PASS' ON THE GATE FOR US ? IS THERE A PARTICULAR CLUB OFFICIAL OR STEWARD TO ASK FOR WHO WILL SHOW US WHERE TO FILM THE MATCH FROM ? Whether you have contacted your opponents to find out if they are interested in booking us as well (and sharing the cost). Once we have all the above information, we will then confirm the availability of a cameraman and send you a Confirmation of Booking letter by e-mail which will give you all the necessary details as to how and when to pay. Your cameraman for the match will normally arrive at the venue at least an hour before the kick-off. On doing so, they will enter the ground as per the Home Team's instructions (i.e. which entrance to go in, whether to pick up a ground/press pass, which steward or club official to see regarding where to video the game from, etc.). If you are the Home Team, please ensure that our cameraman is given a printed team-sheet and/or a free match-day programme before the kick-off, as we will require the players names and shirt numbers (and the Team Managers’ names) if we have been booked to edit & produce match highlights. THE PLAYERS’ FULL NAMES (no initials or middle names) and CORRECT NUMBERS OF SHIRTS WORN ON THE DAY. At most of the Cup Finals we film for clubs at parks' and A.F.A. level, we find that the Team Manager is normally (and understandably) too busy to write out all the above details for us, so we strongly advise clubs to appoint another club member as being responsible for providing this information. It is always best if a club can find somebody to write things down as the match goes on, especially for details such as the correct shirt numbers for players, substitutions made and the goalscoring order, as these can all be easily forgotten after a match and it is extremely difficult for us to guess which player is which if we do not have the correct shirt numbers available when we are editing the footage. This is also extremely important if you have chosen the option to have professional commentary added to your match. The one-camera filming of ACADEMY SHOWCASE MATCHES has become one of our most requested services in recent years, and this is something we are keen to do more of when these matches are played between Monday to Fridays, daytime or evening. This involves filming the game from a raised vantage point above the half-way line as always, but with the aim of being close enough to the action to be able to edit highlights showreels from the footage for each particular player instead of using a constant wide-angle view of the pitch from a distance (or a greater height), which is more for team & tactical performance analysis. Closer filming of the action allows Club Managers & Scouts to receive individual player showreels that will give them a clearer view of a player’s positioning on the pitch and also their attitude & concentration during the match from facial expressions and mannerisms. For example, when the ball is in play, we film the action as we normally would for TV & internet match highlights productions (as opposed to 100% wide-angle for tactical & performance analysis), focusing in on certain players when the ball goes out of play if they have just had a shot at goal, made a good save or made a mistake. This is also different from filming ‘Player-Cam’ style where the camera follows one player for the whole match instead of following the ball. We do not provide that service as it is something that anybody can do. Our service in filming these Academy Showcase matches is particularly beneficial for Colleges in the U.S.A. that offer scholarships to young players from the U.K., as individual player highlights can now easily be uploaded online using various platforms instead of producing DVDs or having to send scouts to the actual venues to watch matches themselves. PLEASE NOTE that if your Academy are playing against another Academy/Club/Organisation in a Showcase game that you want filmed, you MUST obtain your opponents permission, particularly if the match is being played on their Home ground. This is very important if any Under-18’s are playing in the match, as parental permission may be required. Under no circumstances will we film matches ‘undercover’ for scouting purposes. Our price for filming an Academy Showcase match is just £100.00 (not including travel expenses or individual highlights editing). Further details can be found on our Filming Options & Price List page.